News in over the weekend from Mark Elliott at International Yacht Collection that he's sold his central listing for sale, the 45.72m motor yacht Encore acting for both vendor and buyer. This marks 312 yachts sold so far this year, a major increase on the 2012 total of 272 sales. 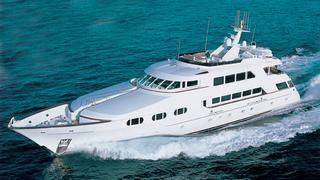 She was built by Trinity Yachts in 1998 to ABS class and features a Dee Robinson interior. A large main saloon has three comfortable couches and a full entertainment system plus a formal dining area. The expansive teak-floored aft deck is covered and has a full wet bar, fridge and icemaker, ideal for al fresco dining and entertaining. A favourite area aboard Encore is a skylounge with excellent views out to sea, a lounging area, entertainment system, wet bar and games table. The skylounge continues out to an aft upper deck with ample seating and a custom dining table. The sun deck includes generous chaise lounges, sunpads and wet bar with stools overlooking the Jacuzzi tub. MCA compliant, accommodation is for up to 11 guests in five staterooms plus 10 crew. The full-beam master suite is on the main deck and has a king size bed, vanity unit, large windows, fridge and a marble en suite with shower and Jacuzzi. Below are three double staterooms with queen size beds and a twin cabin, all with en suite bathroom facilities. Encore had a major refit in 2012. Upgrades included new 2,250hp Caterpillar engines, new zero speed stabilisers and a complete interior refit. Encore was asking $10.9 million.